Please share existing pages in their own language with which they know. 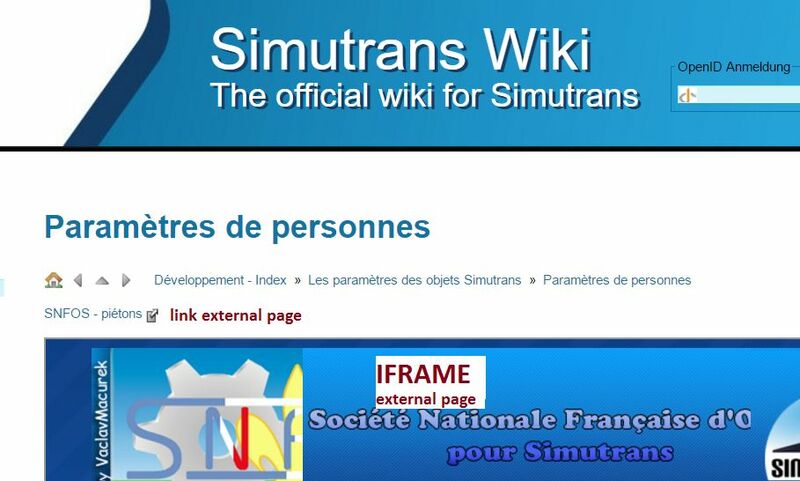 So these pages can link in Tikiwiki also integrated via iFrame (if possible). Bitte teilt existierende Seiten in ihrer eigenen Sprache mit welcher sie kennen. Same, and I don't understand what you want exactly. Source code of the pages ? Understanding your messages is difficult. Can you write in both English and German ? I have poor German but it could help a little. Or can you ask someone to translate your messages to English ? Anyway, I tried several times to see the page that you linked (simutrans-germany.com/wiki/wiki/tiki-index.php?page=fr_PedestrianDef) but it does not load. I understood that you want to include SNFOS pages via iFrames. If you need permission to do it: it's okay. Anyway I would prefer if you simply link to SNFOS website or, at least, add the link above the iFrame.